The Kolobov Novaya Opera Theatre of Moscow makes it Israeli debut presenting one of the greatest Russian epic tales of all time – Prince Igor. Scores of soloists, choristers and dancers perform Borodin’s sweeping score which features the ever popular Polovtsian Dances. Prince Igor and his army are about to set out on a campaign against the Polovtsy and their Khans. 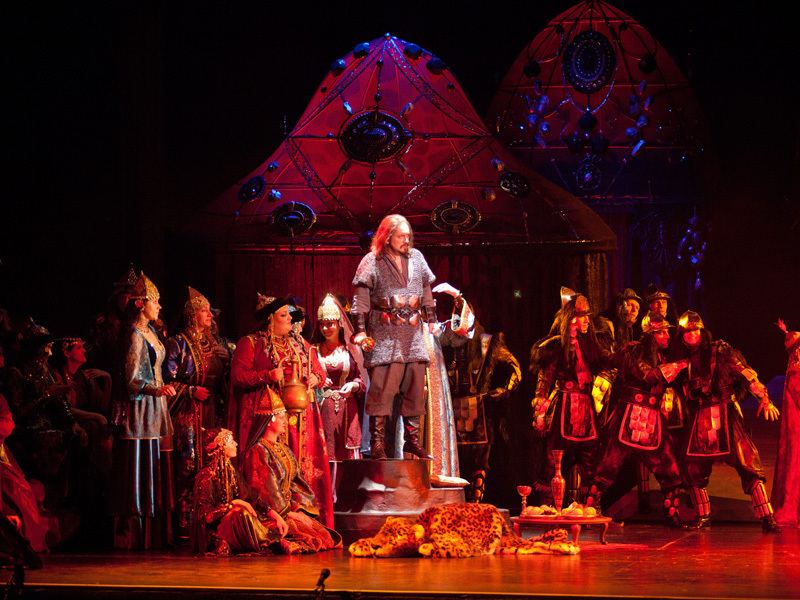 The people praise prince Igor, his son Vladimir and the soldiers. Suddenly a solar eclipse takes place. The people are terrified; they think it to be a bad omen and ask the prince to cancel his campaign. But Igor has made up his mind. He bids farewell to his wife Yaroslavna and leaves her to the care of prince of Galich, Yaroslavna’s brother. The army takes the field. The prince of Galich, taking advantage of Igor’s absence, is feasting with his followers. Two drunken gudok players, Skula and Yeroshka, are entertaining the party. The prince is dreaming of ruling Putivl instead of Igor and of sending Yaroslavna to a convent. The feast is interrupted by a group of young women, who beg the prince to restore their abducted friend. But the prince rudely drives them away. The prince’s followers are mulling over the possibility of bringing him to power in Putivl. But Yaroslavna’s influence is very strong. Yaroslavna is worrying about why she does not hear from her husband. The young women come to tell her about the evil deeds of the prince of Galich, asking for her help. 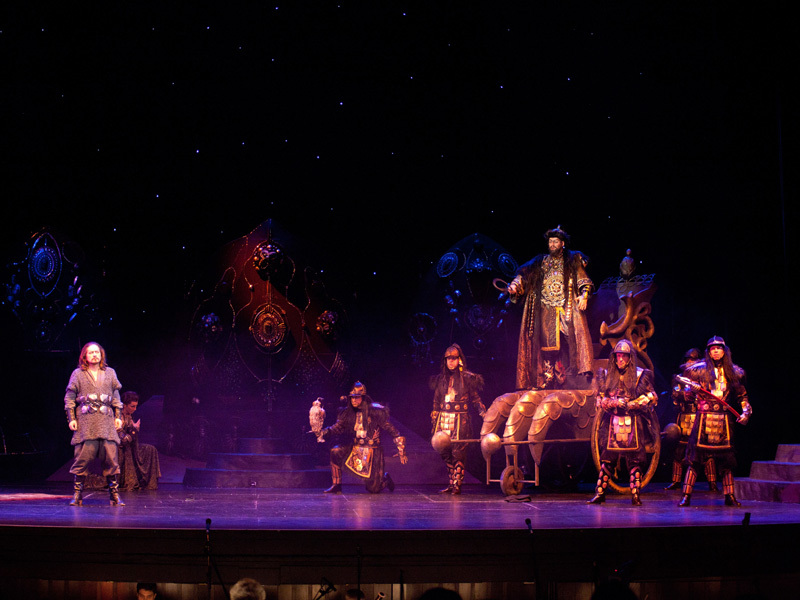 Yaroslavna demands that the prince returns the girl. But he just mocks her and threatens to seize the throne in Putivl. The boyars announce that Igor’s army is defeated and he and his son are captured. Khan Gzak, Konchak’s ally, is about to attack Putivl. The people led by Yaroslavna are preparing to defend the city. Prince Igor and his son are in captivity. In the evening Konchakovna, the Khan’s daughter, is longing to see her beloved Vladimir, who is also craving to see Konchakovna. The love scene is interrupted by Igor. He ponders about his defeat, about his native land, about Yaroslavna. Ovlur, a Christian Polovtsian, stealthily comes up to Igor. He suggests they flee. Igor is in doubt. Khan Konchak tries to entertain his captives with music and oriental dances. The Polovtsians praise their Khan. This entry was posted in OPera and tagged Alexander Borodin, Borodin, Moscow, Polovtsian Dances, Prince Igor, Tel Aviv, The Israeli Opera. Bookmark the permalink.